Hear one, hear all... our second character download at www.weirdass.net is here. 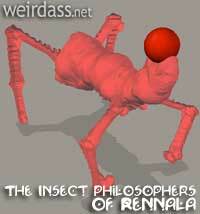 We are giving away one of the Renn, the insect philosphers of Rennala. The model is in Poser 4 (pz3) format and has been stuffed into a self extracting archive. For PC users, please check out either the Poser forum online or Renderosity.com for instructions on conversion. Model has only a rudimentary Poser 4 color texture, as we use Bryce for texturing. Made on a mac, it should expand out to around 1.2 megs. Please read the Legalese before download. Click here to download one of the Insect Philosophers. Click here to download a set of poses for the Renn. At right are the Renn as they appear in the Starry Ones, meeting with the Grey.